Visit knowledge.energyinst.org/collections/shale-gas for more information. The Energy Institute has published A Guide to Shale Gas; FREE to download it addresses the technological, environmental and legal aspects of exploiting this energy source. The UK government has promised to support the safe deployment of shale gas as part of the UK’s energy policy, but fracking applications have been rejected by local councils. There has been vigorous debate about the potential benefits and risks of developing shale gas in the UK. Produced independently and based on sound science, this 20-page document – knowledge.energyinst.org/collections/shale-gas – aims to bring scientific and technical accuracy to the debate and to help readers expand their knowledge of the subject. 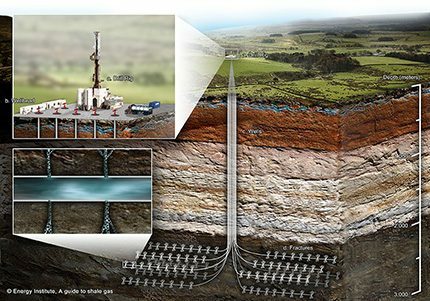 It explains in factual terms how shale gas is extracted, its impact on the environment and its potential role in meeting future UK energy needs. Louise Kingham OBE FEI, Chief Executive, Energy Institute, says, “Our Energy Barometer survey among energy professionals has highlighted the need for the energy industry to improve its communication with the public. A guide to shale gas explains what it is and where it comes from – as well as its potential impacts and legal framework. It has been developed from an extensive review and analysis of existing literature and contributions by over 75 subject specialists – including professionally qualified EI fellows and members from relevant backgrounds and experience. It has also been subjected to a robust peer review process prior to publication. The guide is available to download free of charge. Hard copies are also available at £10 each (bulk discounts are available for community groups, organisations and academia).